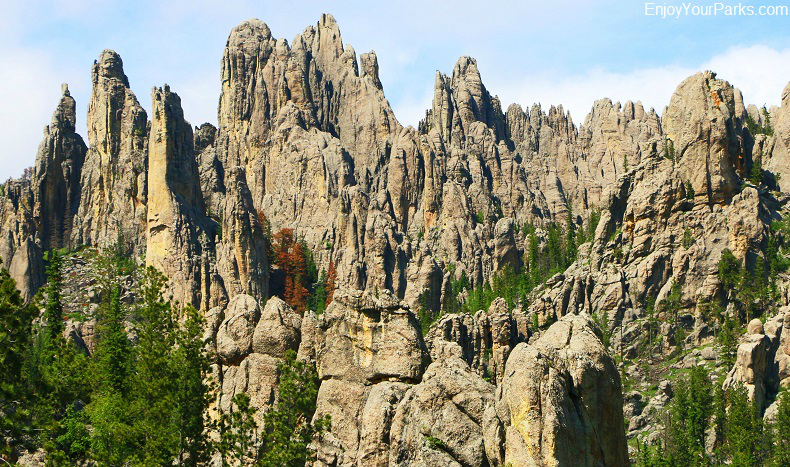 drives, camping and numerous hiking trails, Custer State Park is among the top tourist destinations in the entire Black Hills area. Located only 15 miles from the town of Custer, at 71,000 acres Custer State Park is one of the nations largest state parks and is considered by many to be one of the top wildlife viewing destinations in the world. 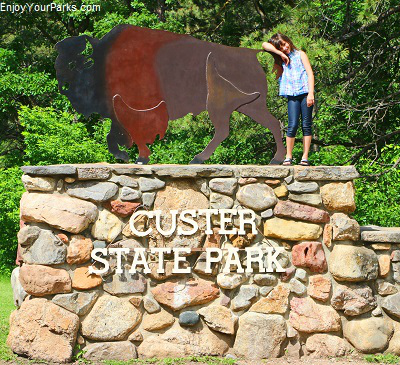 Founded in 1912, Custer State Park is undoubtedly a "must see and do" during your South Dakota vacation. 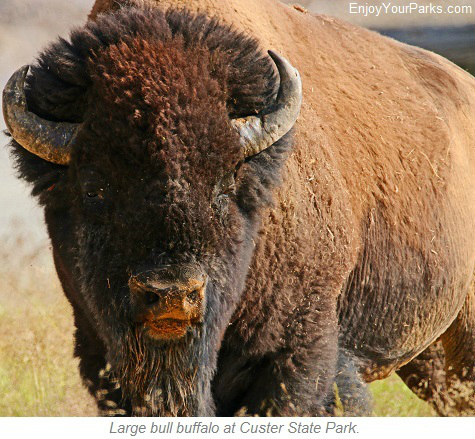 Custer State Park is home to a wide variety of free roaming animals such as American buffalo (bison), mule deer, whitetail deer, elk, bighorn sheep, mountain goats, pronghorn, feral burros, prairie dogs, coyotes and mountain lions. Visitors commonly use the Wildlife Loop Road to view these amazing animals from their cars. 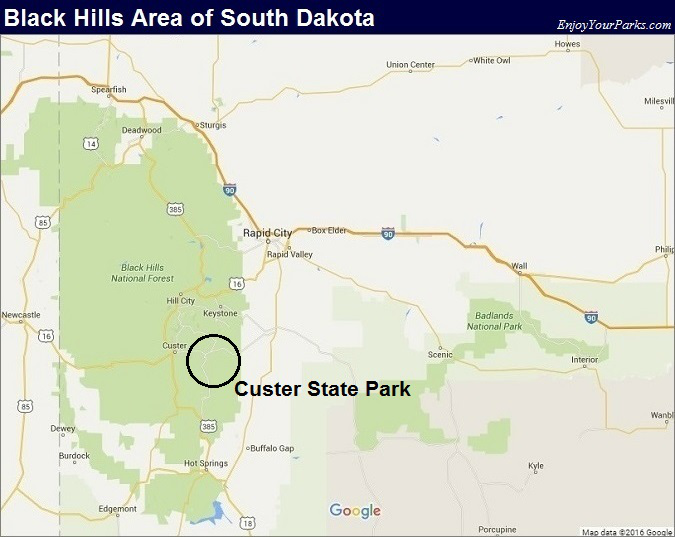 The Custer State Park Wildlife Loop Road is 18 miles in length, and is a semi-circle route that originates at the State Game Lodge and ends at Blue Bell Lodge. This nicely maintained paved road takes visitors through prairie grasslands and Ponderosa pine-covered hills. Located along the Wildlife Loop Road are numerous well-maintained dirt "spur" roads that allow cars to gain access to more remote sections of Custer State Park to further enhance their wildlife viewing experience. 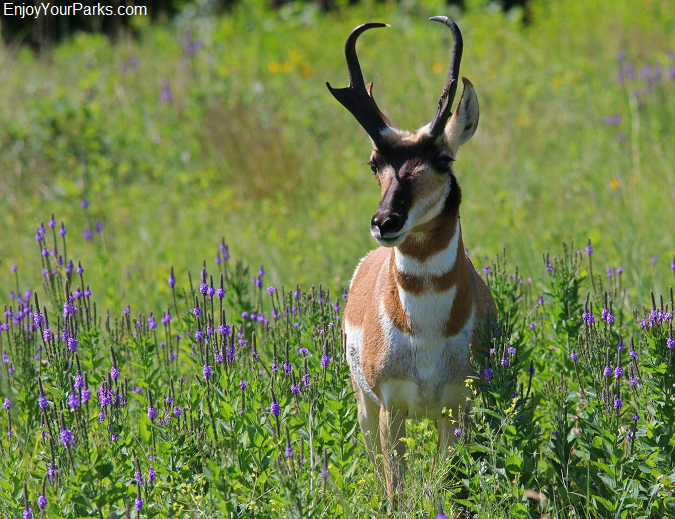 To assist visitors in finding and identifying the many species of wildlife found along the Wildlife Loop Road, the Custer State Park Wildlife Station Visitor Center is there to help. Located on the Wildlife Loop Road, this helpful visitor center even has a map showing visitors where the buffalo herd was spotted during that particular day. We recommend that visitors at least allow an hour to drive the Wildlife Loop Road at the bare minimum.... as you will want to take time to stop and enjoy watching these incredible free roaming animals. Pronghorn buck along the Wildlife Loop Road at Custer State Park in South Dakota. The Needles Highway begins at the junction of U.S.Highway 16A and South Dakota Highway 87 in the heart of Custer State Park, and ends at the Sylan Lake Area in the northwest corner of Custer State Park. 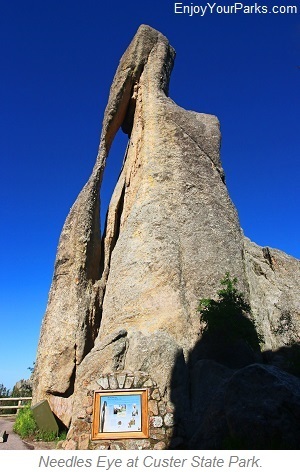 Some of the major features along the Needles Highway are the Needles Eye, Cathedral Spires and the Little Devil's Tower. 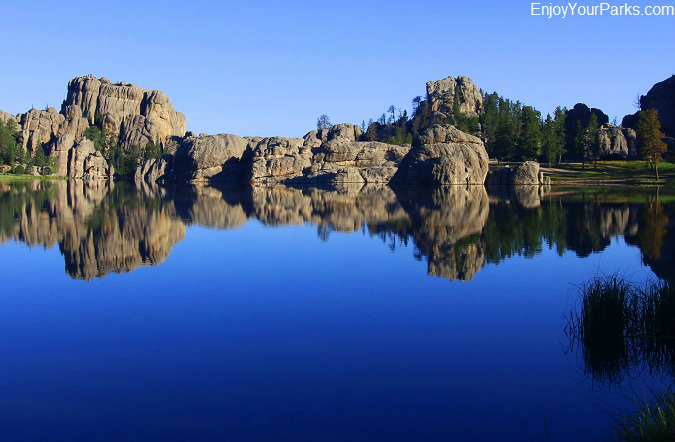 Sylvan Lake is located here as well, which is known as "the crown jewel" of Custer State Park. The Sylvan Lake Area is also where the trailhead is located for those wishing to hike up to the highest point in South Dakota, which is Harney Peak (7,242 ft). 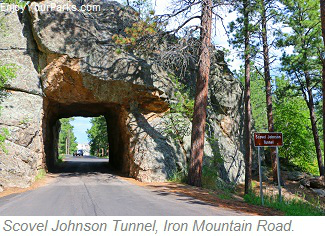 Iron Mountain Road runs between Custer State Park and Mount Rushmore. 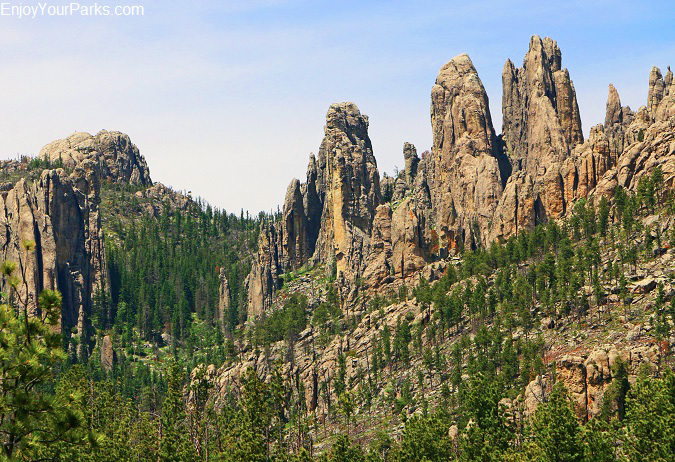 Two thirds of the Iron Mountain Road lies outside Custer State Park, but this "must see" road originates in Custer State Park at the junction of U.S. Highway 16A and South Dakota Highway 36. 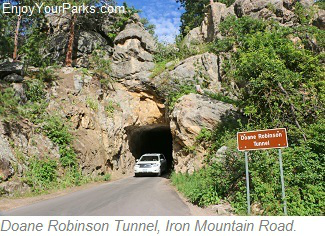 This incredibly scenic and winding road was built in 1933, and provides outstanding views of the Black Hills as visitors travel through numerous tunnels and bridges. Needles Highway at Custer State Park in South Dakota. The Needles at Custer State Park in South Dakota. 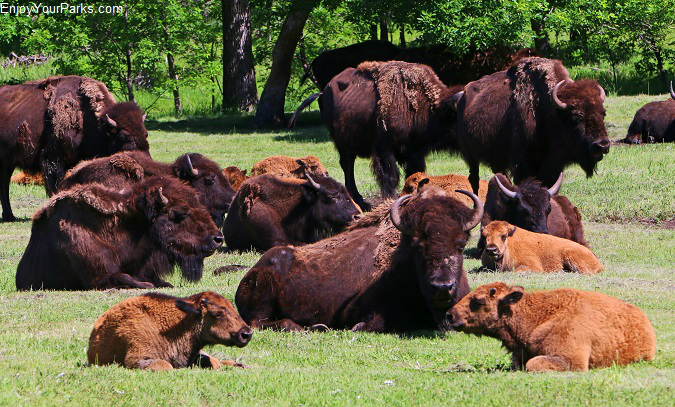 Custer State Park is home to a world-renowned herd of 1,300 free-roaming buffalo (bison). This massive herd originated in 1914 when Custer State Park was known as the Custer State Game Sanctuary. 36 buffalo (bison) were purchased by the State to start the herd, and in less than 30 years the herd exploded to over 2,500 buffalo! This created serious over-grazing issues in Custer State Park, therefore the number of buffalo was slowly reduced each year during the popular Custer State Park Buffalo Roundup. Typically held in September of each year, the Buffalo Roundup has become an annual event where people from all across the globe come to see the show. Visitors can watch the Custer State Park Buffalo Roundup from the corrals located on the Wildlife Loop Road and no reservations are needed. During the roundup, calf buffalo are branded with an "S" and a single digit above it. The "S" indicates that the buffalo is part of the Custer State Park herd, and the digit represents the last number of the year that the calves were born. Buffalo Herd at Custer State Park in South Dakota. 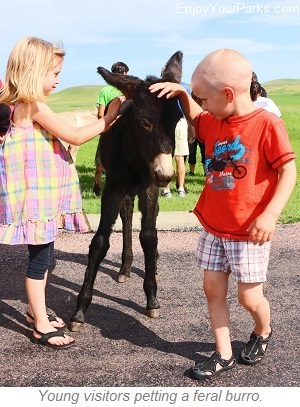 Custer State Park is also home to feral burros (donkeys). These wild burros have been appropriately named "Begging Burros" as these donkeys commonly approach passing cars throughout Custer State Park and "beg" for food. 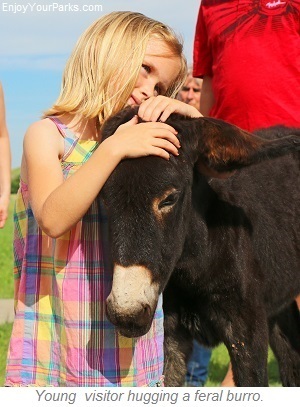 Due to their popularity, visitors have even been known to bring food specifically to feed these feral donkeys. There are approximately 50 feral burros found in Custer State Park, and have gained quite a reputation throughout the years for causing "burro jams", which are a result of the donkey's stopping traffic. The Custer State Park feral burros are actually descendants of a herd of burros that once upon a time carried visitors up to the summit of Harney Peak. When these rides were eliminated, these burros were released into Custer State Park.... and the rest is history! Feral Burros at Custer State Park in South Dakota. 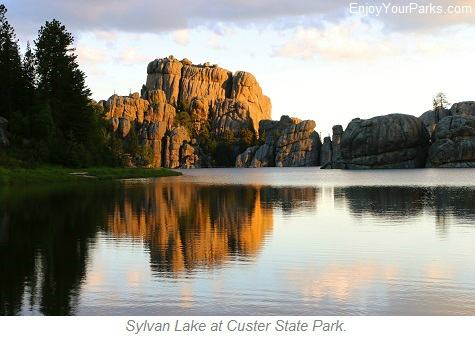 Sylvan Lake is known as the "crown jewel" of Custer State Park, and is located in the far northwest corner of the park in an area known as "The Needles Area". 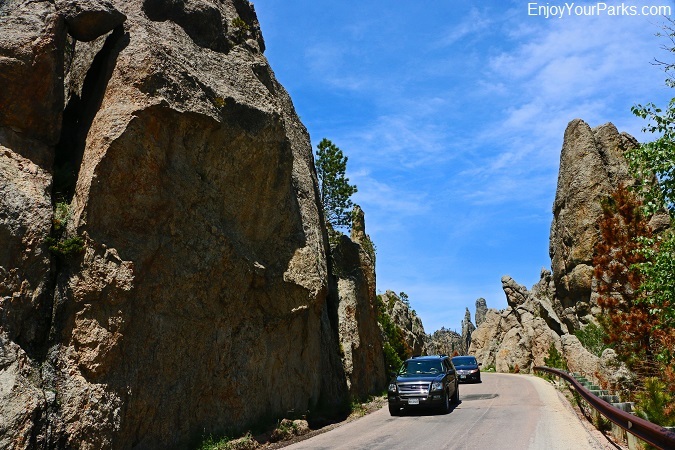 To reach this area of Custer State Park visitors must take the scenic Needles Highway that begins at the junction of U.S. Highway 16A and South Dakota Highway 87. Sylvan Lake was created in 1881 when Theodore Reder constructed a dam across a geologic feature known as Sunday Gulch. Granite formations are found throughout the area, creating an extremely scenic setting. There are picnic area provided as well as small rental boats. Rock climbing, swimming and hiking are the most popular activities in the Sylvan Lake Area, as well as the trailhead to the most popular route to the summit of Harney Peak, the highest point in South Dakota at an elevation of 7,242 feet above sea level. There are also several other popular trailheads in the area that take hikers into the "Needles" area of Custer State Park. Harney Peak, ending at the summit where there is a stone lookout tower. The view from the summit of Harney Peak is nothing less than magnificent, so if you like to hike, the Harney Peak Trail is without question a "must do" during your visit to Custer State Park. 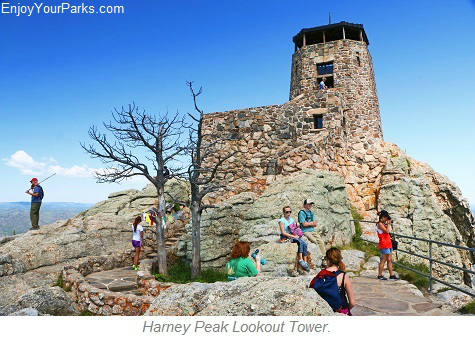 CLICK HERE to learn more about the hike to Harney Peak. 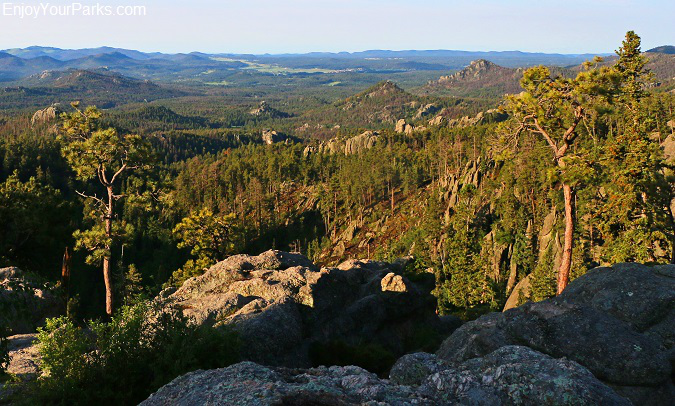 In addition to the Harney Peak Trail, there is a multitude of hiking trails found throughout Custer State Park that take hikers into amazingly scenic and remote areas. 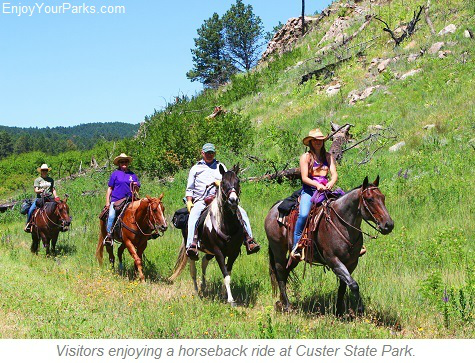 Check with the Custer State Park Visitor Center for a list of these trails as well as trail conditions. Hiking, biking and horseback riding are allowed on most of the designated trails. 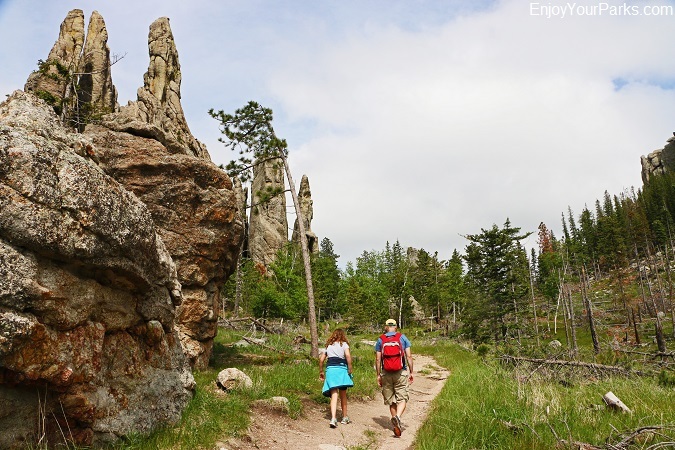 Hikers enjoying a trail at the Needles region of Custer State Park in South Dakota. 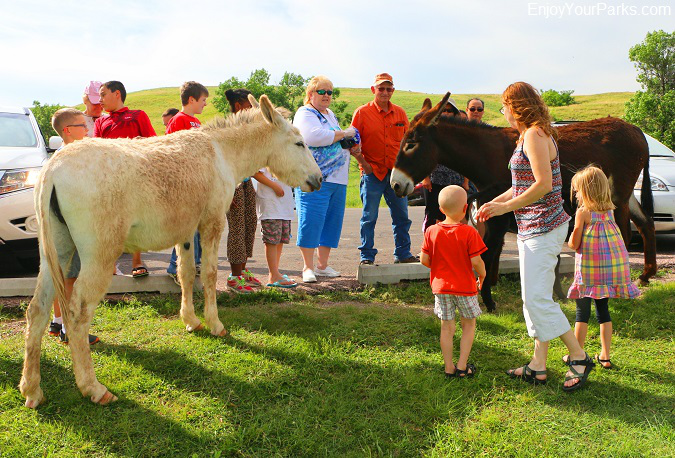 There are three main visitor centers found at Custer State Park, which are the Peter Norbeck Visitor Center, the Wildlife Station Visitor Center and the brand new Custer State Park Visitor Center that just opened in May of 2016. 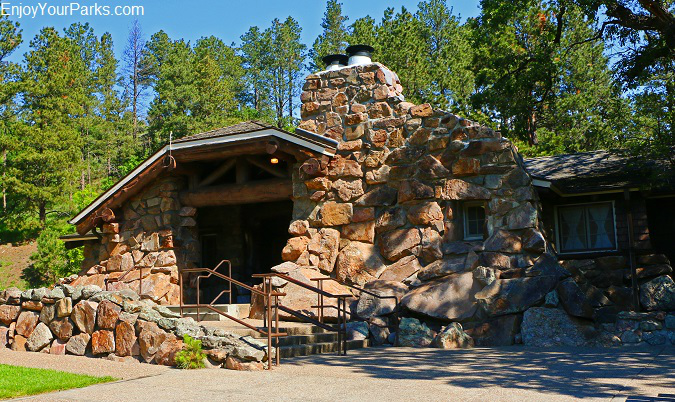 Peter Norbeck Visitor Center at Custer State Park in South Dakota. Visitor Center provides displays and exhibits regarding Custer State Park and the Black Hills area in general. There are several large animal mounts, a book store and information about the naturalist programs provided at Custer State Park. 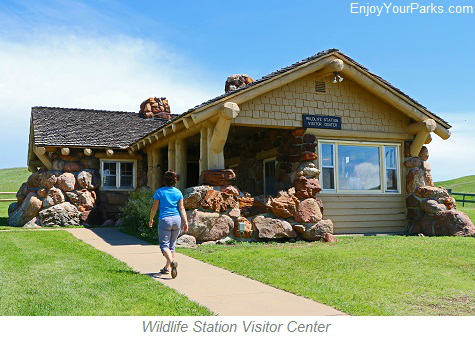 Located on the Wildlife Loop Road in Custer State Park, the Wildlife Station Visitor Center is extremely helpful in assisting visitors in finding and identifying wildlife along this popular loop. 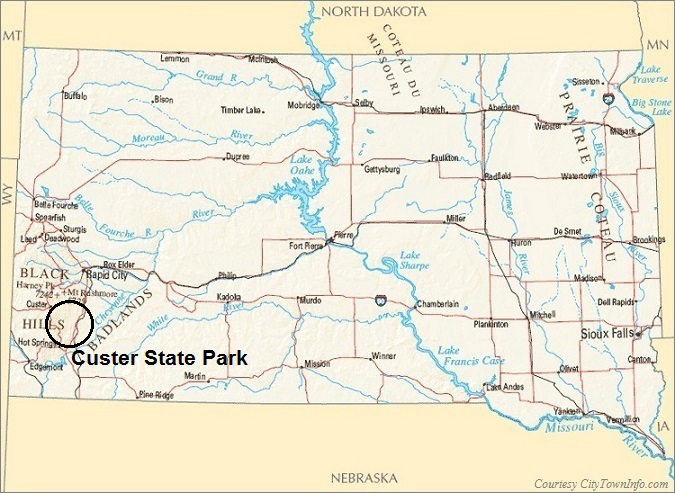 There is also a map that marks the daily location of the Custer State Park Buffalo Herd. Located at the junction of U.S. Highway 16A and the Wildlife Loop Road, the Custer State Park Visitor Center was recently opened in May of 2016. This gorgeous facility assists visitors with questions as well as being home to outstanding exhibits and displays. There is a 100 seat theater that presents an amazing film that introduces visitors to this amazing state park in a very effective and exciting way. buffalo safari jeep tours, chuckwagon cookouts and watercraft rentals, guided nature walks and evening programs. There are nine designated campgrounds found throughout Custer State Park. Some can be reserved and some are "first come, first served". 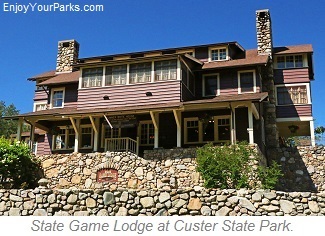 The Custer State Park Visitor Center will have current information on the status of these well-maintained campgrounds. Back country campgrounds are also available for backpackers heading into the remote areas of Custer State Park. 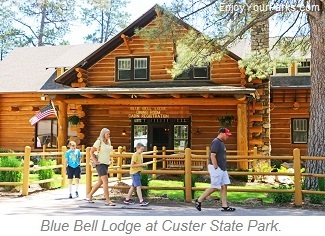 Blue Bell Lodge, Sylvan Lake Lodge, State Game Lodge and Legion Lake Lodge are all located in Custer State Park and all provide dining and shopping for Custer State Park visitors. A scenic view at Custer State Park in South Dakota.